The capital of Norway is also its largest city. It has apprx. 660.000 inhabitants and covers 454 square kilometres.The city is located at the head of the 100-kilometre Oslofjord. The fjord’s 40 islands are great for recreation, and many of them can be reached by ferry. Over half of the municipality of Oslo is covered by forests and parks, making Oslo a truly green city, where opportunities for outdoor recreation are always nearby. Oslo’s climate is milder than its latitude might indicate. Summer temperatures often equal those of cities much further south, yet the winters are usually cold enough to make Oslo a great skiing destination. Oslo hosted the 1952 Winter Olympics and the 1930, 1966, 1982 and 2011 FIS Nordic World Ski Championships. The prestigious Nobel Peace Prize is awarded annually in December in Oslo City Hall. The Royal Palace is found at the end of the main street, Karl Johans gate. Oslo has been the capital of Norway since 1814, when Norway gained its independence from Denmark. Many of Norway’s principal educational institutions, research facilities and businesses are based in Oslo, which is also the home of important cultural institutions such as the National Museum of Art, Architecture and Design, the Norwegian Opera and Ballet and the National Theatre. Stavanger is the largest city and the county’s administrative Centre. The city of Stavanger has 130 000 inhabitants. 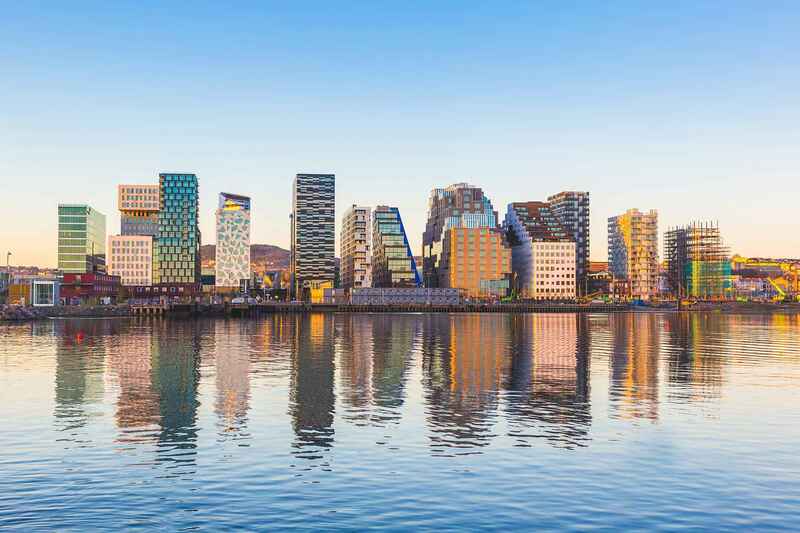 The region of Stavanger has a versatile and dynamique business environment known to be innovative and value-adding. International orientation and active networks all contribute to ensuring the region’s economic growth and prosperity in the future. The landscape stretches from the flat Jæren area by the sea, to the mountains in the east. Fjords and islands give a dramatic presentation. The inhabitants use the neighboring areas for leisure and recreation. Distances from north to south, and from east to west are short, and not more than an hour. Historically the region is presenting the Viking Age, from the battle in Hafrsfjord in 872 AD. until 1050, with sites both in Sola and Stavanger. In 1125 the Stavanger Cathedral was erected, and made a large impact on the small town of Stavanger. Through the following centuries the region was kept poor, until 1810, when the herring came in large quantities to the coast. This gave the fishing industry a huge growth. At the same time this growth gave new opportunities to other industrial activities. And in the last part of the 1800’s the canning industry was developed, and tons of canned sardines were exported in the years to come. In the mid 1950’s new technical requirements led to the need to look for new industry. The shipping industry managed to keep renewing itself. In 1969 the first oilfield was discovered at Ekofisk, south in the North Sea, which made this region an important part of Norway, and is today Europe’s oil and energy capital. The main source of income for the people comes from working in the petroleum sector. Together with the petroleum industry you will also find aqua cultural and agricultural centres. At Sola there is a Norwegian Centre for Aviation Technology. Farming and traditional industries are still important to the region. Bergen is Norway’s second largest city with 277,000 inhabitants. The city was founded more than 900 years ago. As one of the offices of the Hanseatic League, Bergen was for several hundred years the centre of prosperous trade between Norway and the rest of Europe. The main strengths to life in Bergen today are a wide variety of cultural activities, the surrounding sea, international connections and academic activities. 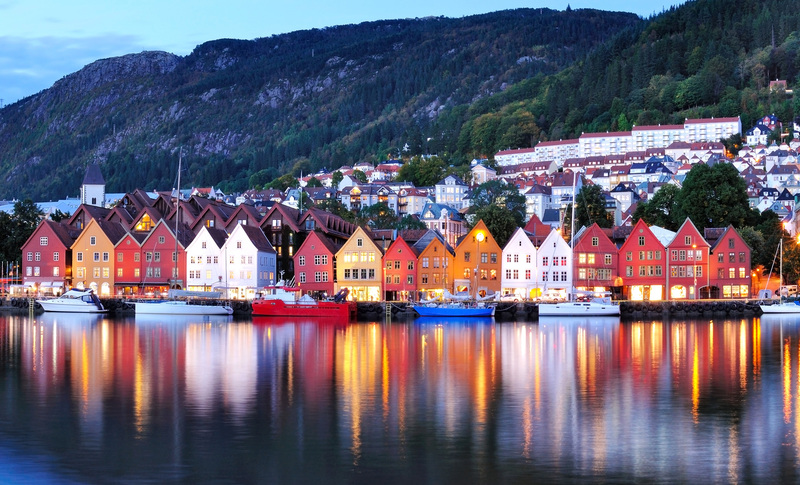 Bergen is an international town with small-town charm and atmosphere. The inhabitants love to show off their beautiful and many-sided city. They are proud of Bergen’s shipping, trading and cultural traditions. The city is like a spectacular amphitheatre clambering up the mountain sides, overlooking the sea, embracing you. You can roam through living history in this modern city, the gateway to the wildest and loveliest fjords of Norway. Tradition, initiative and drive have made Bergen one of Norway’s most vigorous cultural cities. It is not merely by chance that Norway’s biggest cultural event, the Bergen International Festival, is held here each year, or that the town was chosen to be one of the European Cities of Culture in the year 2000. The old parts of town are living history, and the museums and galleries keep both art and the ancestral heritage alive. 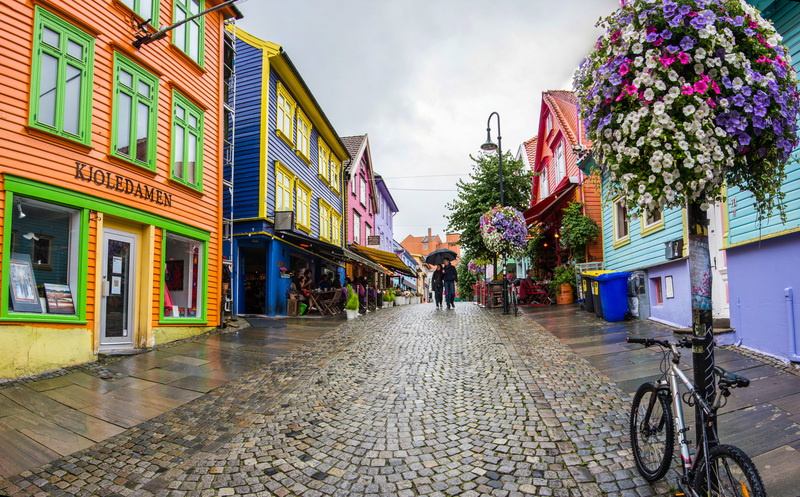 The Hanseatic wharf Bryggen, the Fish Market, the composer Edvard Grieg’s home at Troldhaugen, Rasmus Meyer’s art collection, the Aquarium and Old Bergen are just a few of the many attractions worth visiting. Ålesund has around 46,000 inhabitants. It is the largest town in Sunnmøre, a region known for fishing. 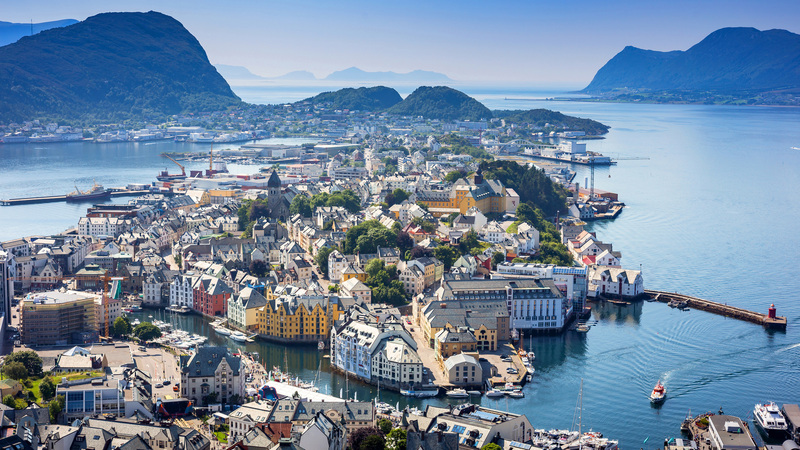 Ålesund is situated at the peak of the fjords in Sunnmøre and consists of several islands. Archeological findings show that there have been settlements within the area for about 9,000 years. The settlements are brought to light in writing through the Viking Sagas of Snorre. The middle age “kaupang” of Borgund was the first “town” in Sunnmøre. The Black Death and the Hanseatics have been blamed for the area’s loss of position as an economic centre during the fifteenth century, and Bergen got control of the Sunnmøre trade. The production of clipfish/split cod (dried, salted cod) in Sunnmøre started around 1750, and this became the most important export product of the area, as well as a major source of the economic growth in Ålesund during the middle of the nineteenth century. The catastrophic fire on 23 January 1904 made more than 10,000 people homeless. Ålesund. The new town was erected in the new architectural style Art Nouveau or Jugendstil. Trondheim has around 187.000 inhabitants.The name Trondheim derives from the old Norse Þróndheimr, meaning home of the strong and fertile ones. The city was founded by Viking King Olav Tryggvason in AD 997, and occupies a special place in Norwegian culture and history. Trondheim was the nation’s first capital, and continues to be the coronation city where Norway’s kings from Harald Hårfagre (872–933) to King Harald V (1991 -) have been hailed, crowned and blessed. In its history the city was and is now again a popular destination for pilgrimages. Trondheim is also an ecclesiastical centre, a regional capital, a centre for industry and commerce, and an important education and research centre. Characteristic wooden architecture: After a catastrophic fire in 1681 destroyed most of the houses in the city, Major Jean Caspar de Cicignon was brought to Trondheim (from Luxembourg) to design a new city plan in the Baroque style. The streets were made wide to prevent fires from spreading. Some of the narrow alleys and narrow streets, many originating in the Middle Ages, nevertheless still exist, contrasting with Cicignon’s wide boulevards from the 1600s. Cultural life: Trondheim has a rich cultural life with an international flavour. Every year at the end of July and start of August the city celebrates St. Olavs Festival, a popular church and cultural festival drawing crowds from near and far. 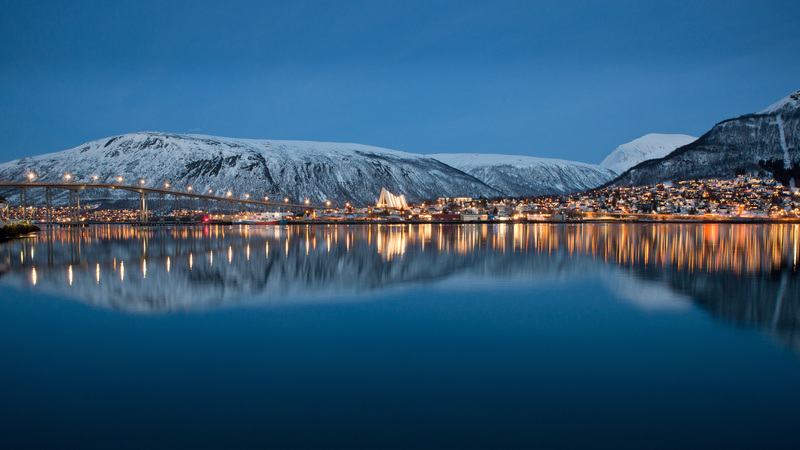 Tromsø is the largest city in the Nordic countries north of the Arctic Circle and is home to the world’s northernmost university, brewery and cathedral. The city lives on education, research, administration, fishing exports and satellite technology. The centre of the north has 75 000 residents and the Municipality of Tromsø covers an area of 2558 km².. Human settlement in Tromsø and Lyngen dates back around 10,000 years, while the Saami culture here goes back at least 2000 years. Scandinavian language and culture could be found here from 300-400 AD, and Lyngen experienced immigration from Finland as early as the 1700s. A strong Norwegianising of the formerly Saami and Finnish areas of Tromsø and Lyngen started around 1900, and from the 1960s a high level of moving from the districts began. In spite of their location so far north, Tromsø and Lyngen both enjoy a moderate insular climate. Summer weather ranges from five degrees Celsius and rain to 28 degrees and fantastic swimming conditions for the undaunted. Winter in Tromsø is not especially cold. The record low temperature in Tromsø is minus18 degrees Celsius, while the average January temperature is minus four, but in return there is often a lot of snow. The Midnight Sun is visible from around May 21 to around July 21. Between November 21 and January 21, the sun disappears under the horizon and we experience the Polar Nights. It is not completely dark during the middle of the day, and the light and colour in the sky is amazing when the weather is favorable. The Northern Lights are particles that are hurled into space after storms on the sun’s surface. They are attracted by the magnetic North Pole, and enter the atmosphere in a ring-like zone around the pole. In a process that is identical to that inside a light tube, the energy is released as light. Tromsø is situated right in the centre of the Northern Lights zone and is, therefore, together with the interior ice in Greenland the tundra in northern Canada, among the best places on earth to observe this phenomenon. The small town of Kirkenes is known as the capital of the Barents Region and the gateway to the East and has approximately 3,500 inhabitants. Kirkenes is situated between two timezones; Helsinki and Moscow. In Kirkenes, which lies in the municipality of Sør-Varanger, people speak Norwegian, Sami, Finnish and Russian. The Russian czar, the Russian Revolution, Finnish immigration, and World War II made their permanent tracks here. The area has a good infrastructure for visitors and there is a whole world of experiences awaiting you: Mountains, fjords, forests, lakes, northern lights in the winter time and the midnight sun between 15 May and 28 July. 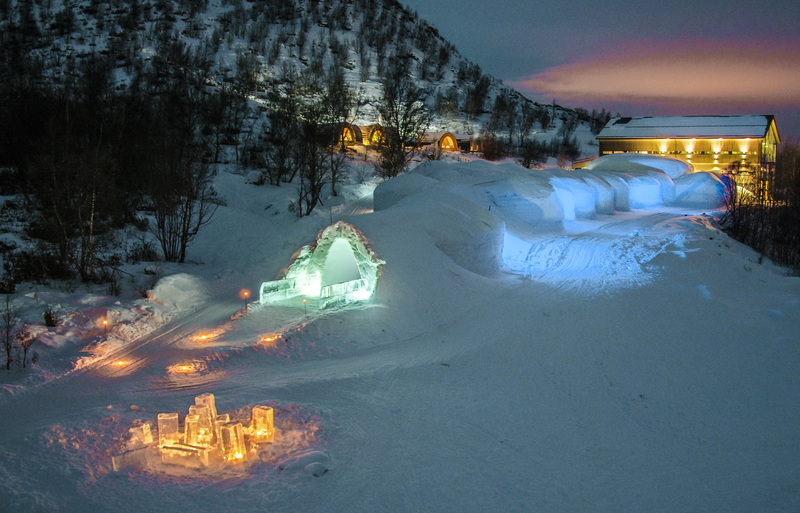 You can for example stay at Kirkenes Snow Hotel – a cool experience! Discover the region in different trips, such as on snowmobile safaris, boat trips, hiking and fishing tours, king crab safaris and dog sledging trips.